Our E3Live Quick Shake Cooler Cup is made of Polypropylene and is BPA-Free! 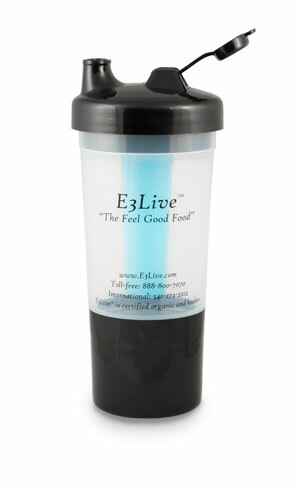 The E3Live Quick Shake Cooler Cup is perfect for fresh, cold shakes while on the go! This BPA-Free bottle is also the perfect reusable water bottle (with convenient storage compartment for your keys or other valuables)—great at the beach or for exercising. Feel good about having a reusable water bottle instead of all those disposable ones. Our Quick Shake Cooler Cup keeps your powder and liquid all in one convenient cup. The removable cup located on the bottom of the shaker stores 60 grams of your nutritional powder while the cup holds 12 fl oz of liquid. The ice wand will keep your liquid cool for hours. You can also use it for your daily eco-friendly water bottle, just fill and go! The fit and finish is great. Well designed too. I'll enjoy using this at work, with my various powder supplements. I really enjoy using this cup for smoothies or water - the ice wand is nice on hot days. I refill it throughout the day with filtered water and don't need to buy all those bottles of water anymore, much more eco-friendly! Thanks! These are the best cups I have purchased, I love the ice cooler in the middle, helps keep the drink cool throughout the day, only complaint is that I would like to see them offered in a larger size to fit more drink in it, otherwise a must have product if you drink shakes and smoothies alot and like to take them with you.